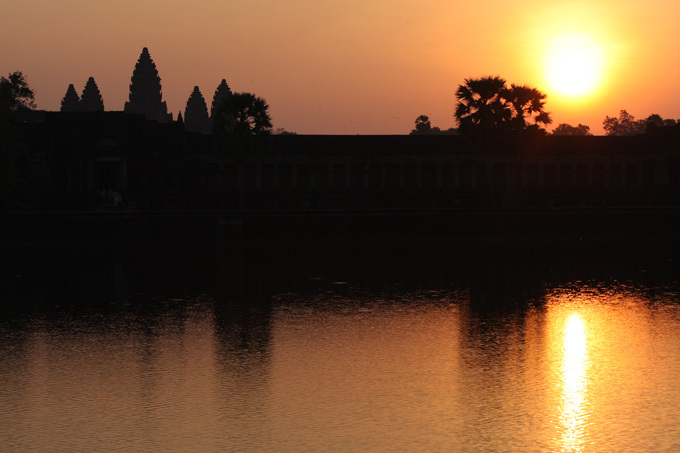 We got up at 4.30 am to leave at 5.00 am for the trip to Phnom Bakheng for sunrise. 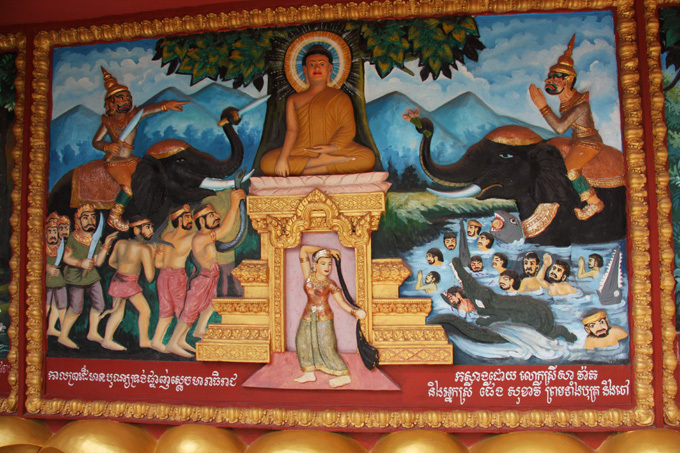 After a surprisingly chilly tuktuk ride we arrived at the foot of the hill. Still completely dark and so needed a torch to walk up the elephant path to the temple at the top. Although a nice place to be, there were cranes working on the renovation and so any good sunrise pictures were tricky. We left fairly quickly and found our driver asleep under a big sack in the back seat …. obviously did not expect us back yet! 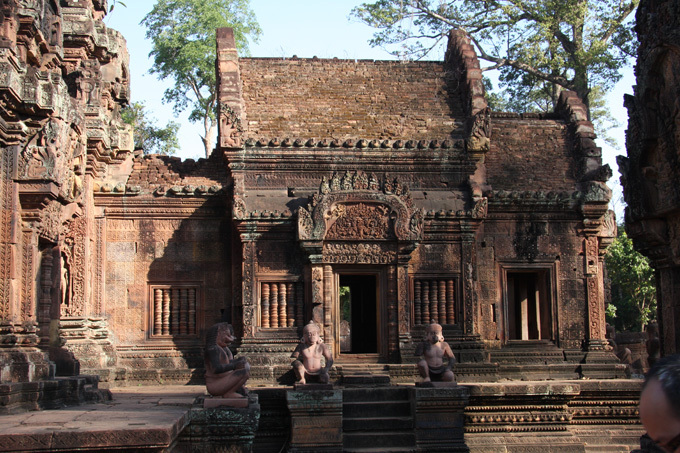 We were heading to Banteay Srei next and the road took us past Angkor Wat, which we were leaving for the next day. We still had a nice view of the sun rising over the Temple. 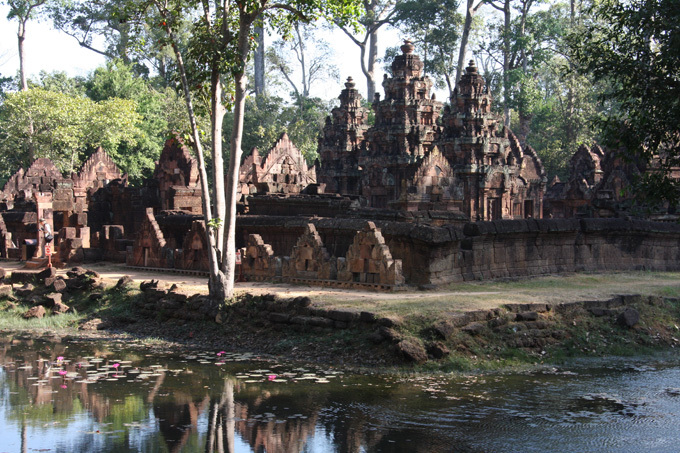 We then had a quick breakfast by Angkor Wat and then headed north east towards Banteay Srei which was around 37km from Siem Reap through some really nice countryside. The Temple was still really quiet as non of the big tour groups had arrived yet (mainly Korean and Chinese). The temple itself is small but very beautiful. 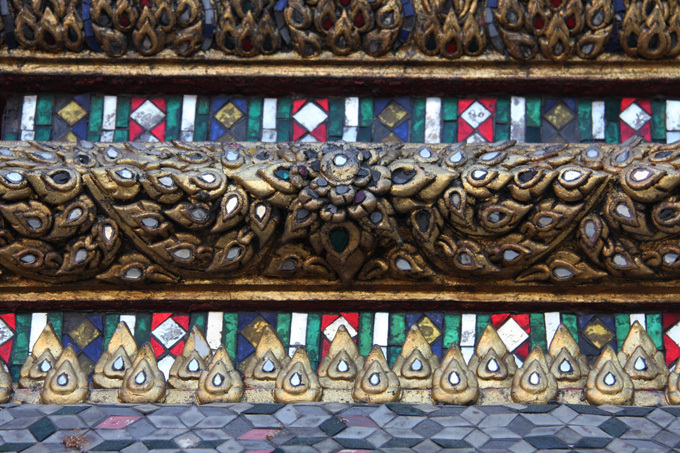 The detailing is incredible and where it is sheltered from the weather is really well preserved. Although the ground has settled under the temples, they have stayed together surprisingly well. They are all made of interlocking stones like a giant three dimentional jig saw. Obviously no cement used! 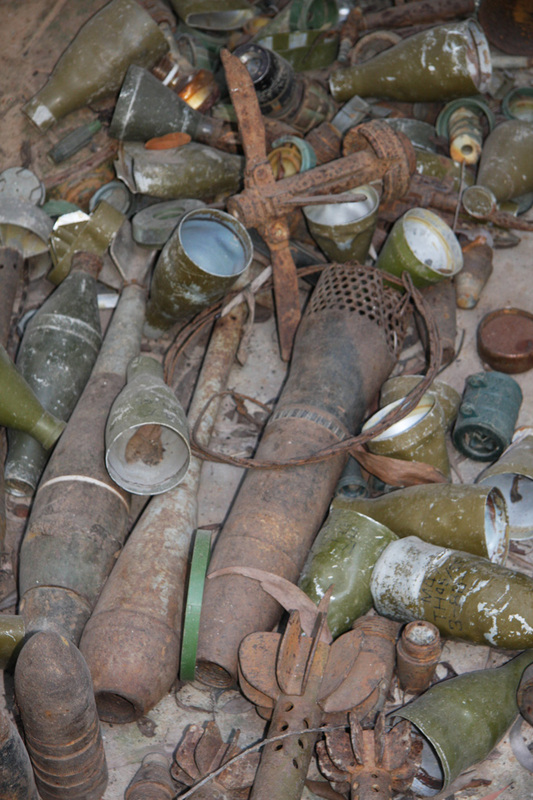 On the way back we stopped at the Landmine Museum which was set up to highlight the problem of the 4 to 6 million mines that still litter the Cambodian countryside. The exhibition focuses on the work of Aki Ra a former child soldier for the Khmer Rouge who started to clear mines from 1997. He also set up a refuge for children who had been injured by mines (around 36 children still live at the centre). 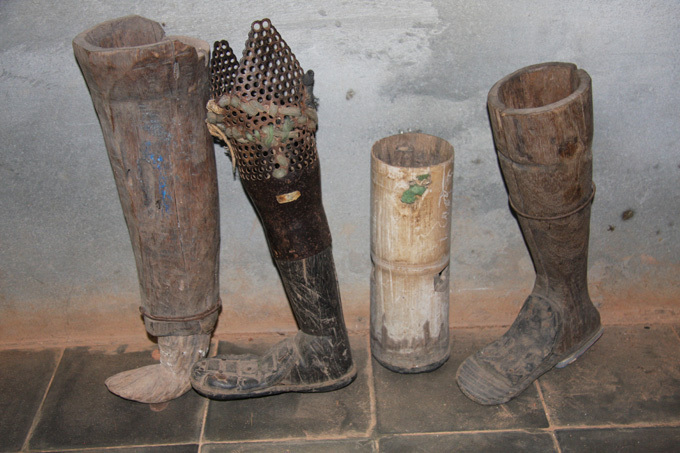 In addition to the landmines are tons of unexploded bombs that are dug up by farmers every day. Something like 15 people a month are still killed or crippled. Drop in if you can, the more visitors, the more good work they can do! 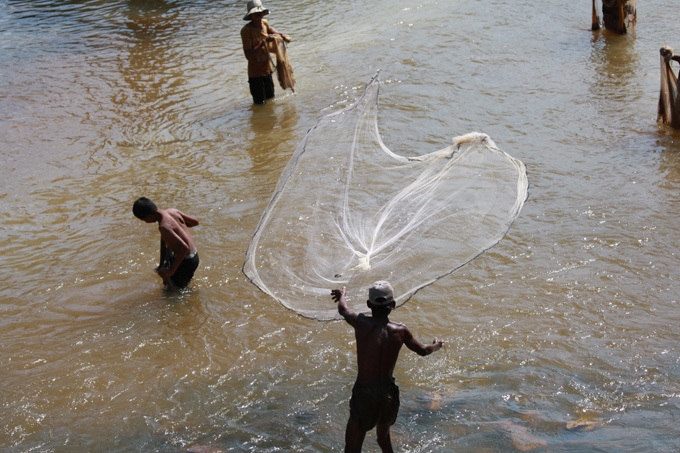 On the way back to the temples we crossed the Siem Reap River and watched the locals fishing. 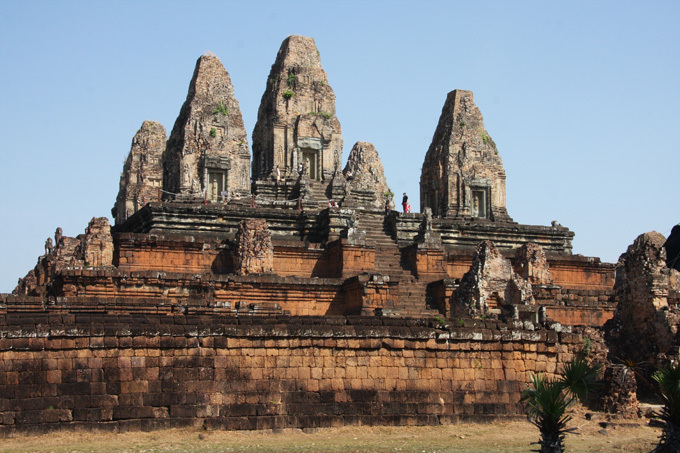 The next temple in the loop was Pre Rup. In between we stopped at a number of other sites and took many pictures. It gets to a point where you need a break as you can’t take any more in. 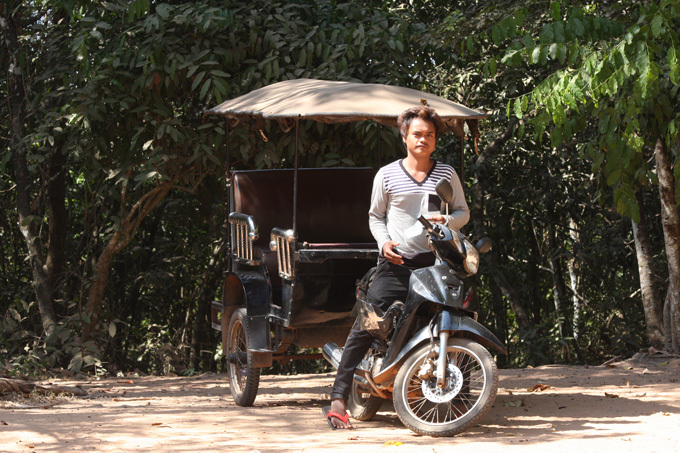 That is the time to point the tuk tuk back to Siem Reap for a shower and meal in one of the many restaurants. Maybe even a bottle of Angkor beer! Tomorrow we have a slower start. Tuk tuk not booked until 7.00am! 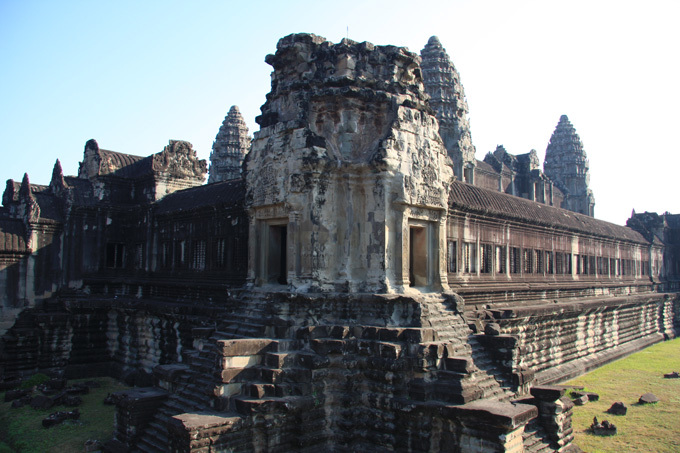 Today we headed straight to Angkor Wat. Most of today would be on what they call the Small Circuit. That is the loop with the most popular temples on. 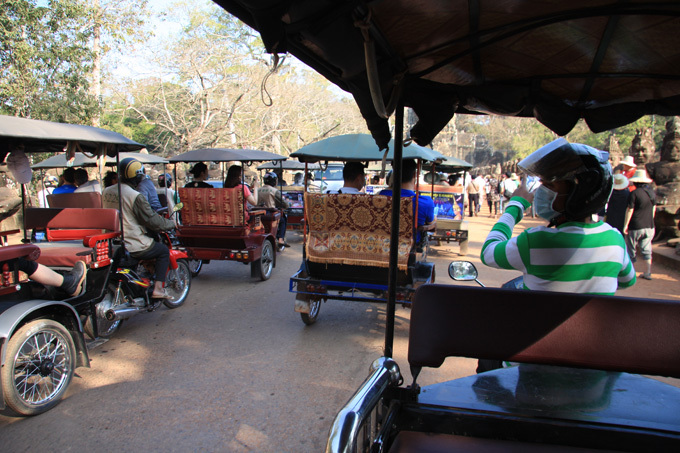 Often people do them all in one day, mainly because it costs about $20 each for the ticket to enter the park and about $15 for the tuk tuk. Two days is obviously more relaxed for people not on a backpacking budget. Traffic on this loop is definitely heavier though! 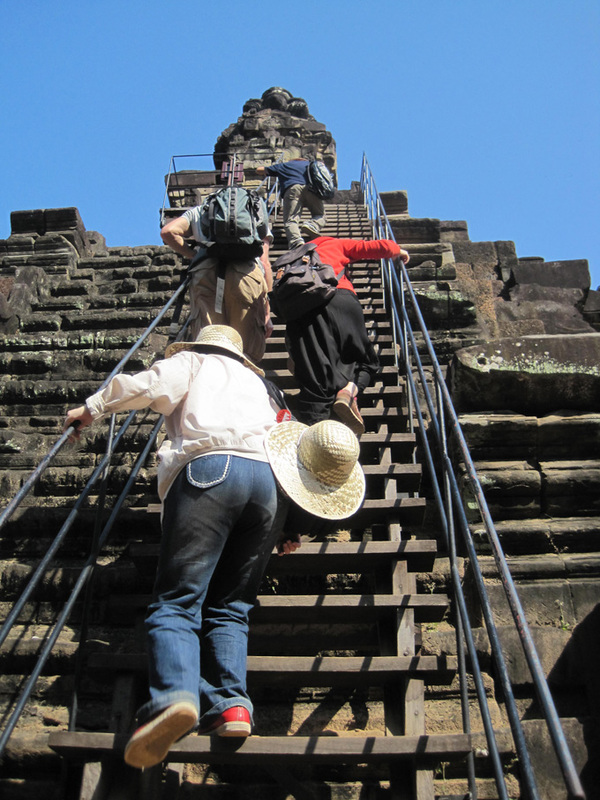 Angkor Wat is not something you can summarise in a few pictures. You need to see it for yourself! 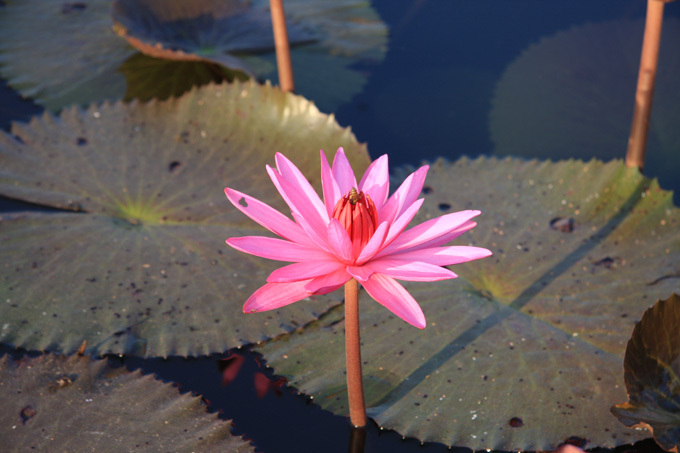 As you go inside you pass ornimental ponds full of lillies. 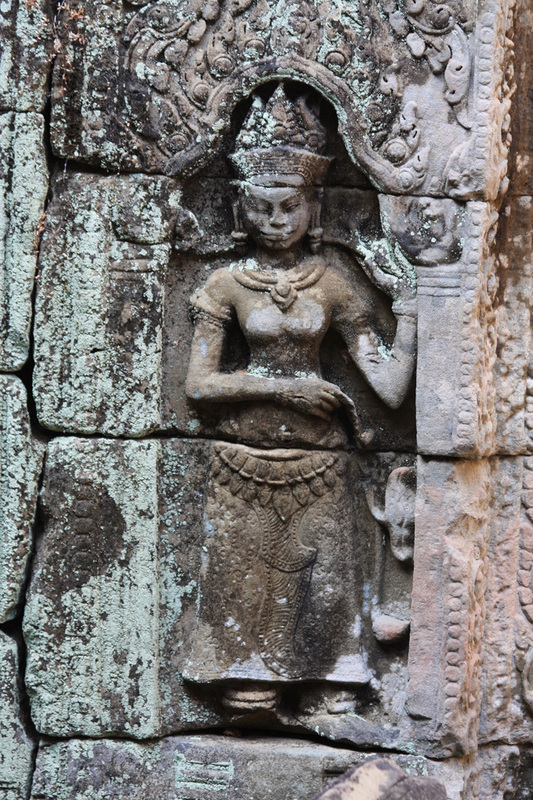 Cambodian girl dressed up to pose for photos with tourists. 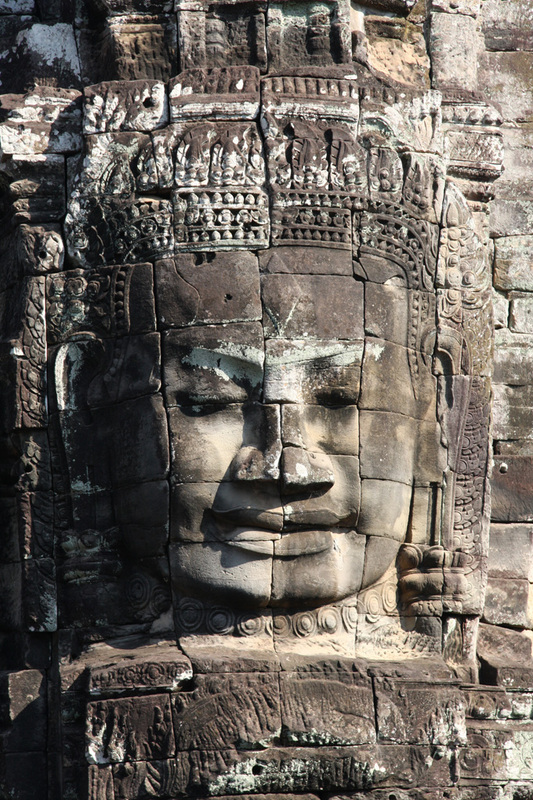 Next we moved on to Bayon which is a temple famous for the faces on the tower, pointing South East West and North. Many are badly eroded but some are still intact. 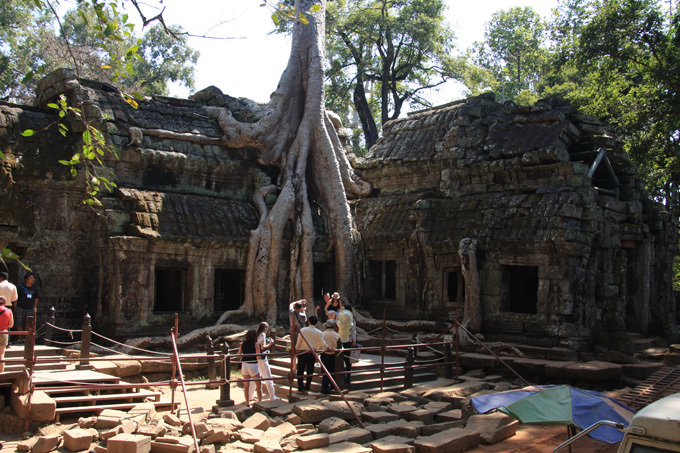 Next on to Ta Phrom which has been used as the set for various films including Tomb Raider. 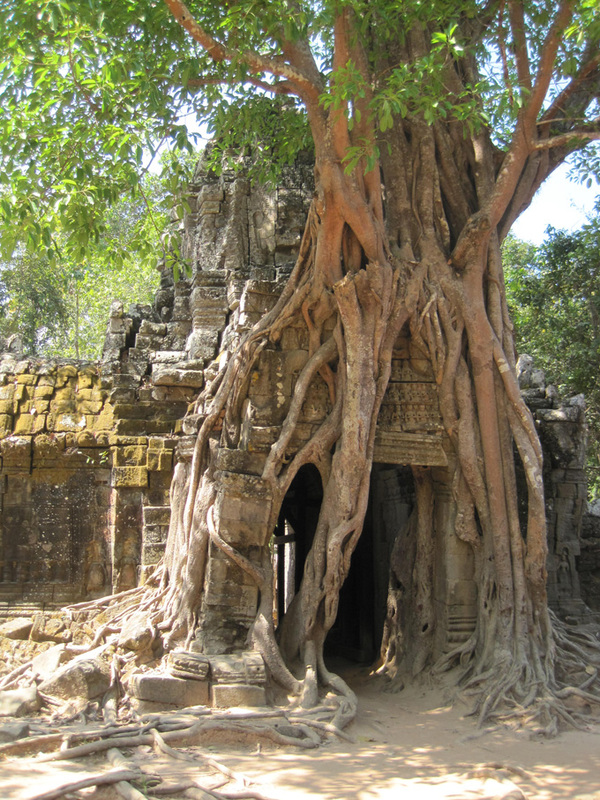 It is amazing how the trees have grown over the temples. People love to see them, but they are also causing slow but major damage. We decided to finish there as we had seen enough temples for now. 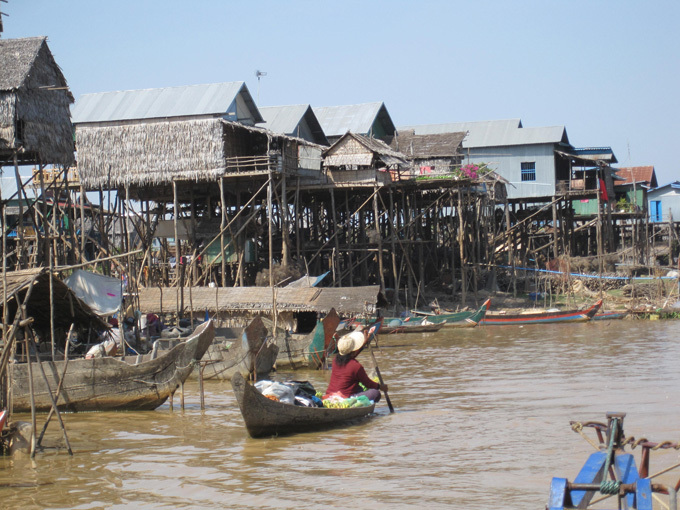 There is a village not far south of Siem Reap that is built on the shore of the big lake. 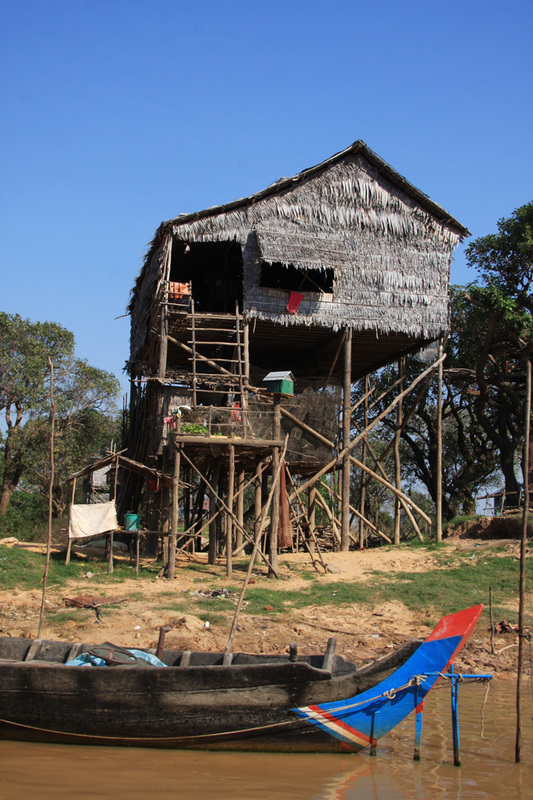 Tanle Sap is around seven meters lower in the dry season (now) which means that the houses either have to float or in this case be built on 10m high stilts. It was a good introduction to life on the water. 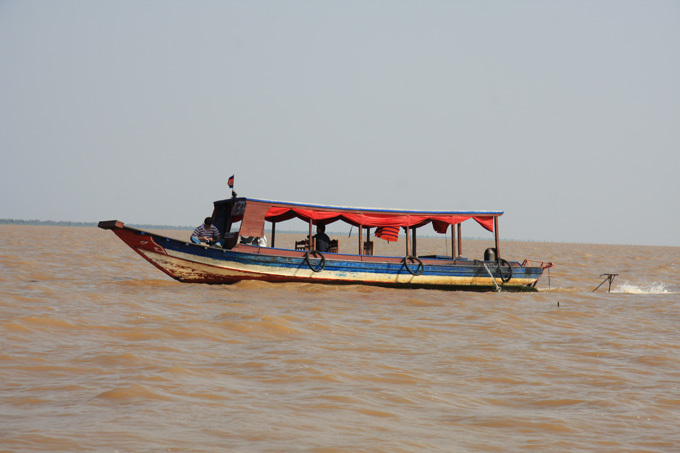 We would see much more tomorrow as we are booked on the boat from Siem Reap to Battambang. 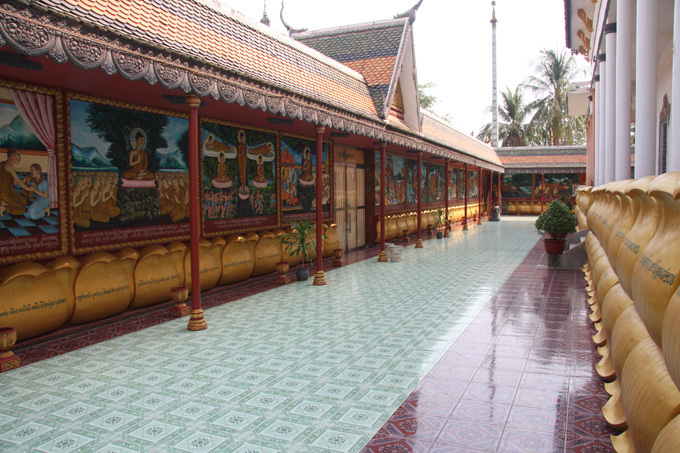 During a leisurely breakfast at the guest house we arranged to spend the following two days exploring the temples. We decided to start with the smaller and less famous ones on the first day, and move on to the big ones on the second day. Save the best until last? We we going to travel by tuk tuk, setting off at 5.00am! With arrangements made we could amuse ourselves around town. 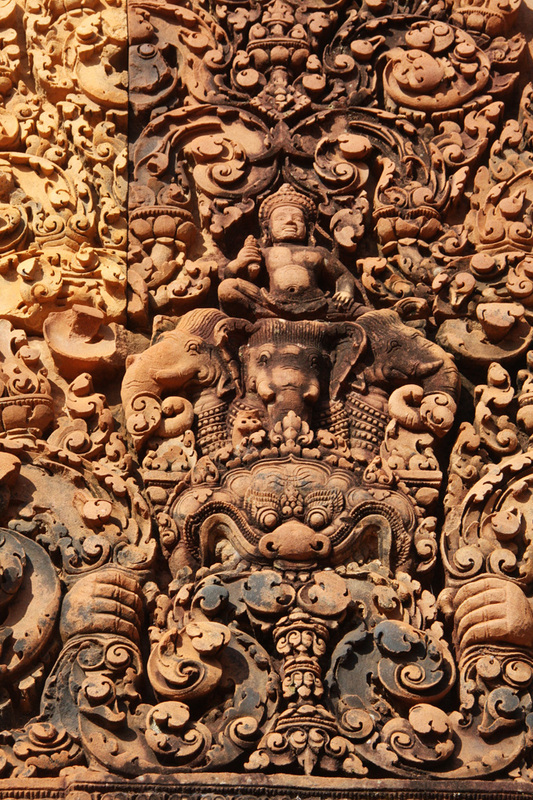 We thought that a visit to the Angkor National Museum would be good preparation for the the temples. 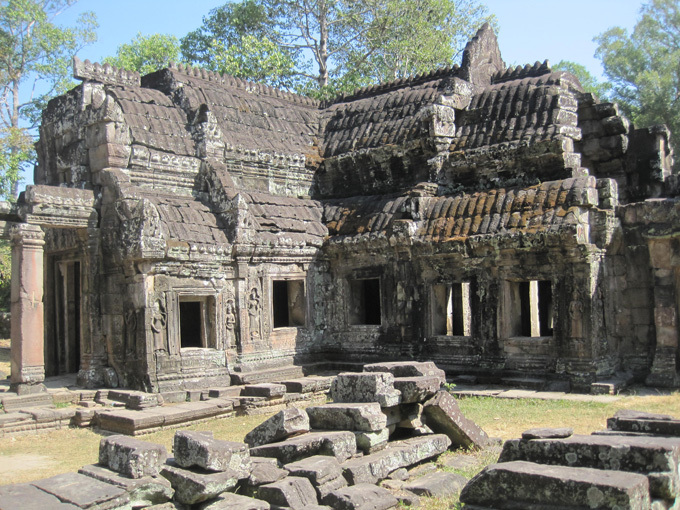 On the way we stumbled across the oldest Monestary in Siem Reap (around 500 yrs). It was beautifully kept and all around the walls stories were told in a series of paintings. I think the cows are a bit newer! When we finally arrived at the museum, it was well presented and gave us an idea of what to expect, but not sure I would bother again. There is a $12 each entry fee plus $3 audio system fee (which may be good for non English speakers, but added nothing if you could read the signs). On account of needing to be up by 4.30am we avoided ‘Pub Street’, particularly a pub called ‘Angkor What?’ that proudly announced that it had ‘Promoted Irrisponsible drinking since 1998’!! 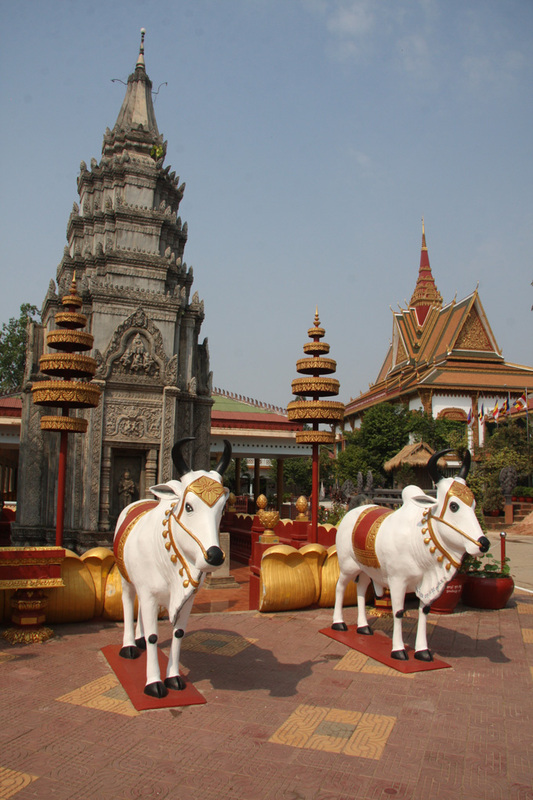 Cambodia 2013 – Not in Troopy! 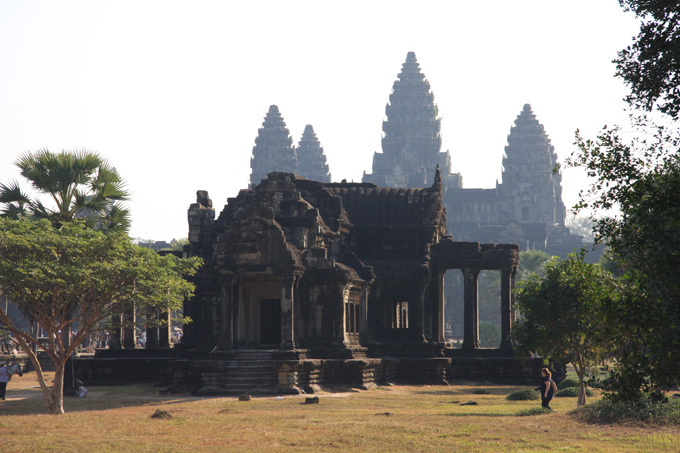 During our drive through South East Asia in 2011 and the first half January 2012 we missed Cambodia. Maybe it was something to do with the number of border crossing that we had done through the six months and the fact that we were getting close to our destination. Like the horse smelling the stables …. we seemed to be drawn towards Port Klang in Malaysia, not wanting to deviate too far. In any case, for whatever reason, we missed what most people agree is one of the most rewarding countries to visit in the world. 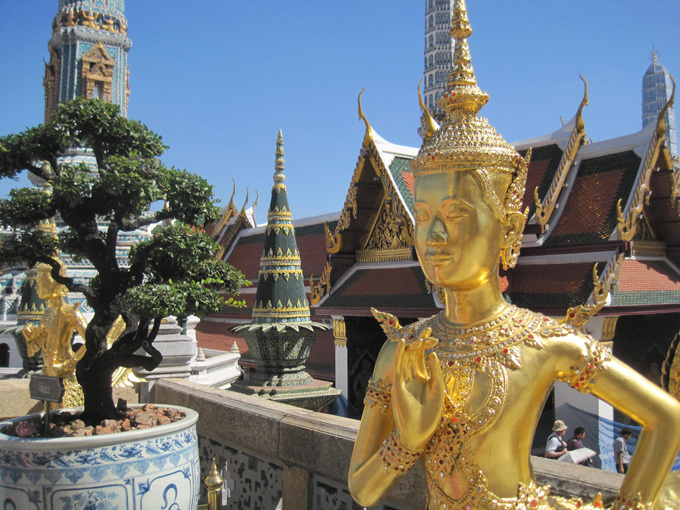 Our flights into South East Asia are in and out of Bangkok and so we will have a day or so there each way. 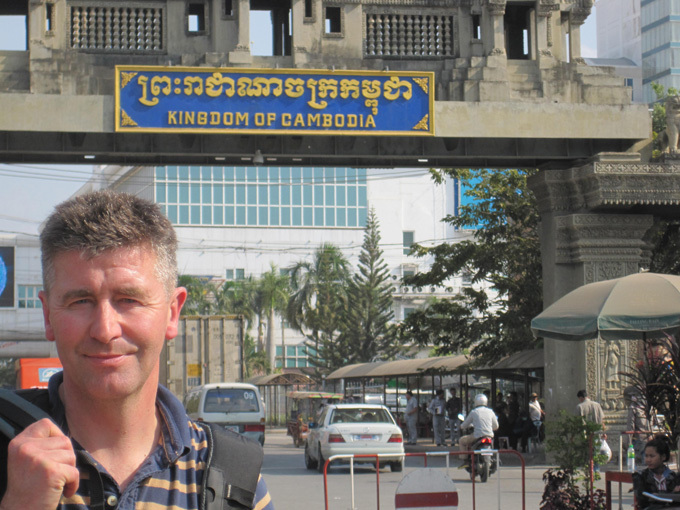 We are following Cambodia with a trip to New Zealand for a month (sort of on the way home! ), where again we will not have Troopy, but will buy an old car, van or camper. Our backpacks are a bit overweight as we have all our camping and cooking gear as well as clothes for hiking. On the way back we are stopping off in Sydney for aweek to visit friends and family. So the next posts will be us travelling without our own transport, storage, fridge, ccoking facilities, bed and everything else we love about overlanding. It will give us a good opportunity to compare the two ways of travelling. 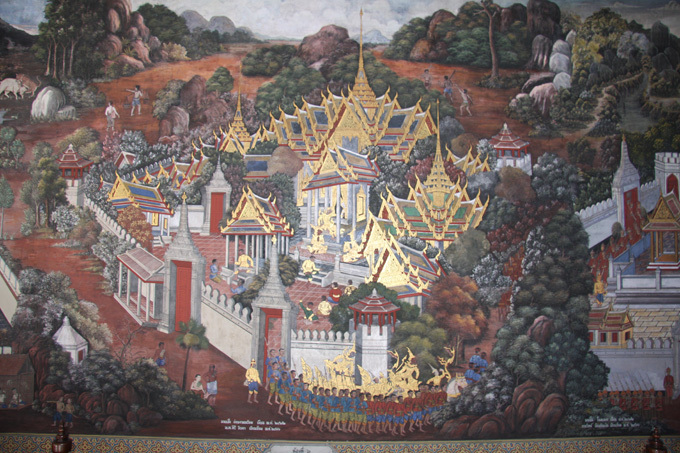 We arrived in Bangkok at aroud 5.00 pm and headed to the hotel Villa Cha Cha in Rambuttri Rd (not far from the Grand Palace). This takes about an hour and costs 400 Bht. 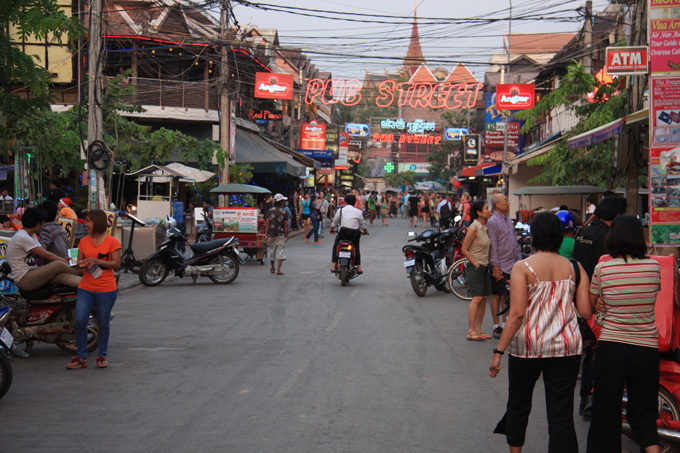 Its a great area to wander around in the evening, with plenty of bars and restaurants to keep us occupied and awake. 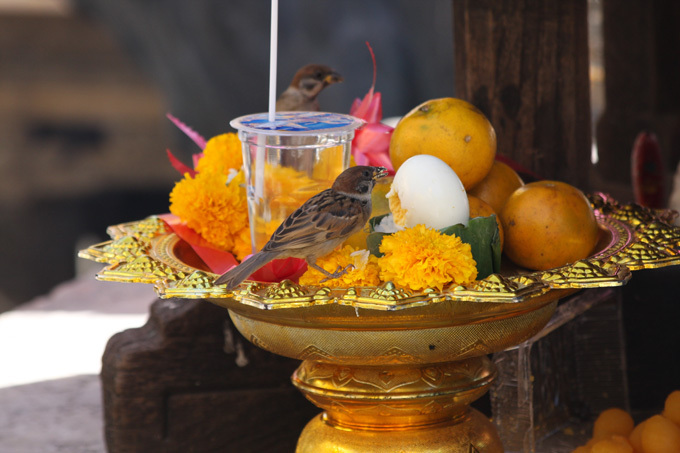 Great to be back in Thailand. 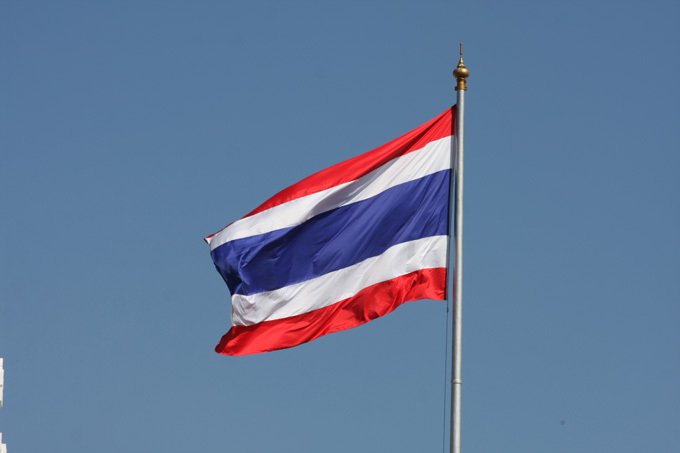 The Thai flag looks great against a clear blue sky! 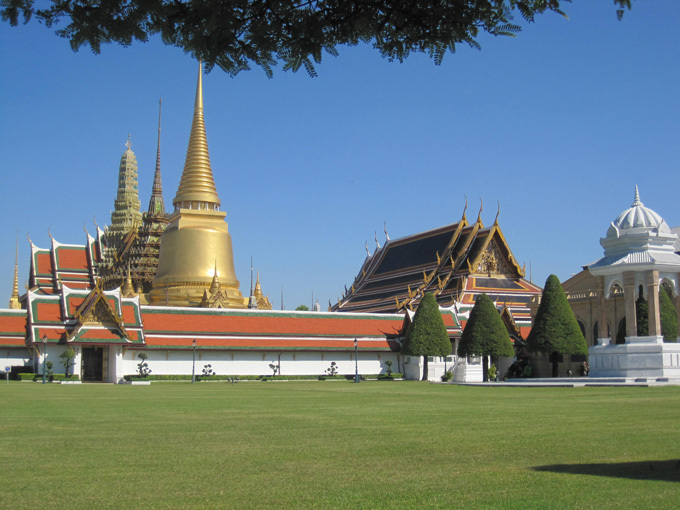 Today we visited the Grand Palace. 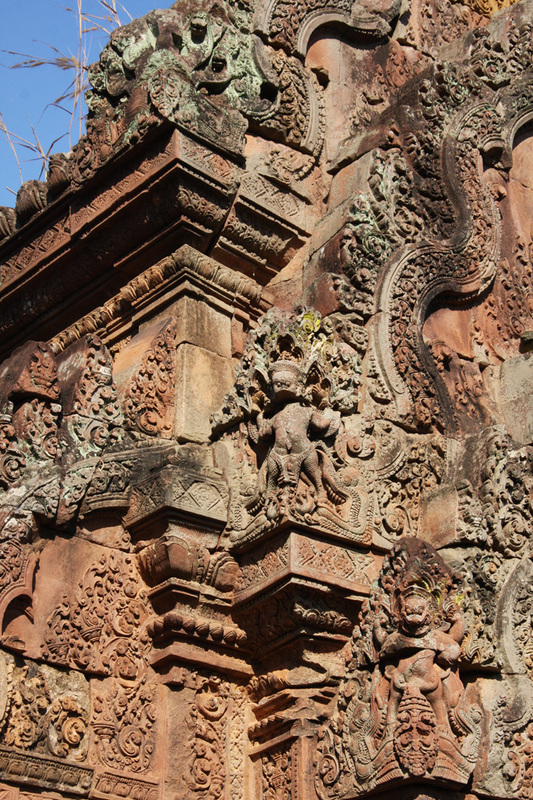 It is a beautiful place with amazing detail. You will never be there on your own, but certainly worth a visit. The minivan picked at us at 7.30 in the morning for drive to the border at Poipot (Cambodian side). It is difficult not to get caught up in the scam issue on this border. At every turn there is an attempt to rip you off. We won’t go into the details here, but read the guide books (eg lonely planet). Nastiest bit is where they get vulnerable non English speaking tourists to change money at the ‘tourist terminal’ at an exchange rate about 30% worse than the rate in Siem Reap. Lots of stories about change being a problem in town …. dont believe any of it. We tried to intervene with a Japanese man who was about to change 10.000 Bht at that rate. We managed to get him to half this, but still a real shame. It is a horrible crossing, but if you tough it out and go through the visa process yourself, it is OK. If you can go a different way. Eventually we arrived at Siem Reap at 9.00pm and took a moto (like a Tuk Tuk) to our guest house which was right near the old market and pub street. It had taken us 14hrs from Bangkok. 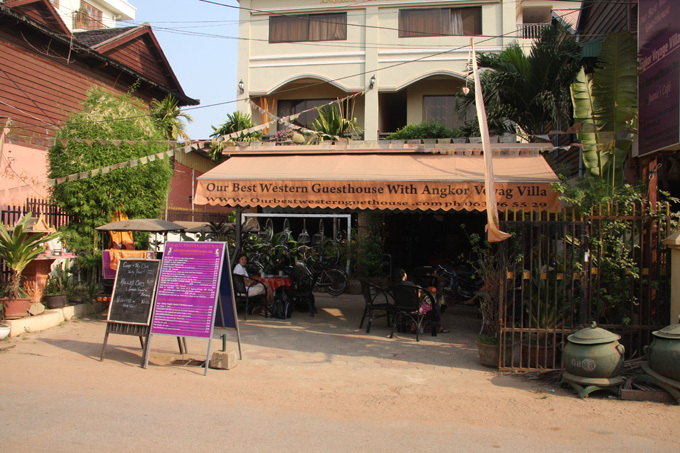 It is called Our Best Western and is run jointly by Australians and Cambodians. Really friendly, with nice staff and service. Tomorrow we plan a relaxed day walking around the area. 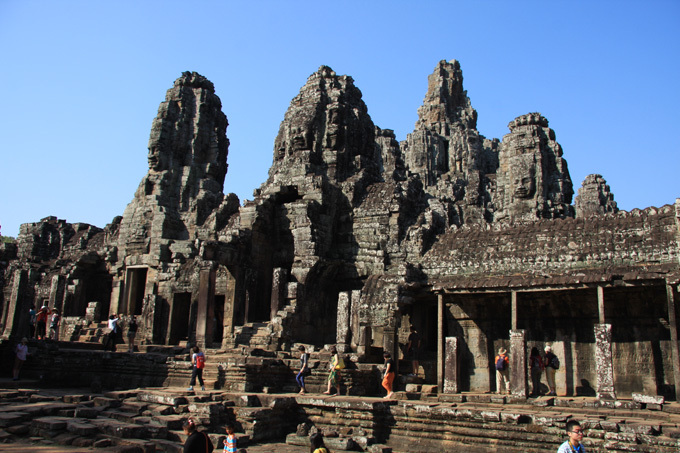 Hope to book transport around Angkor Wat and the other temples.